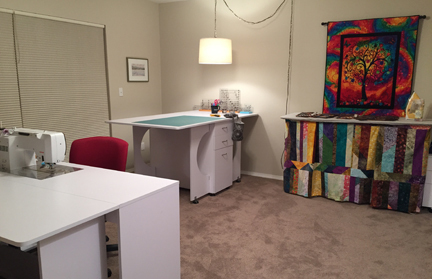 Karen's Sewing Room (and house) For Sale! Hi all. In preparation for my move, I'm putting the word out that my house is available. It's in the quiet neighborhood right next to Hawkin's Nature Preserve, five minutes from downtown. Three bedrooms, two baths, and a BIG sewing room. Almost 1,900 square feet total on an almost 1/4 acre lot. Low maintenance = more time to sew! Click here to download the flyer with more details and photos.